Seidokan Aikido of Tokyo was founded in 1995 as an official dojo of Seidokan Aikido, affiliated with the Aikido Institute of America in Los Angeles, California. Our aim is to promote the understanding and application of aikido principles through regular practice in the dojo. Students can learn a modern style of aikido in an international environment. 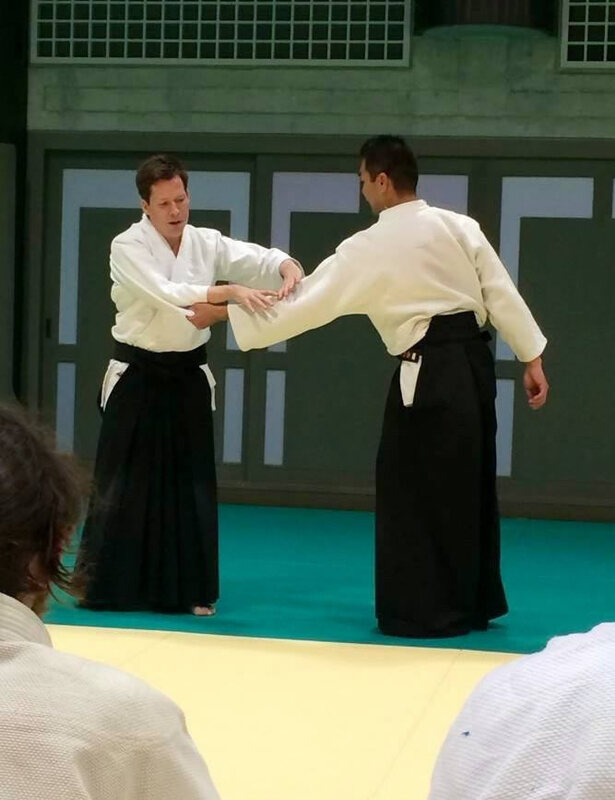 The class is taught in English and led by Chris Koprowski, 5th Dan, Seidokan Aikido. Chris Sensei is from Duluth, Minnesota in the United States. He began his study of aikido in 1989 under Dale B. Bergeron Sensei and Frank Guldbrandsen Sensei, both of Northern Lights Aikido. Chris has been working and practicing aikido in Tokyo since 1993 and has been teaching Seidokan Aikido since 1994. He currently holds the rank of godan (5th degree black belt) and is a certified "shidoin" (instructor) in Seidokan Aikido. He also practices judo at the Kodokan in Tokyo and holds the rank of shodan (black belt). Our dojo welcomes students of all levels--both men and women, Japanese and non-Japanese. Please contact us if you are interested in participating. The first month of instruction is free. Afterwards, dojo fees are ¥1000/month or ¥10,000 per year (in advance). This covers instruction, exams, and dojo administration. In addition, the sports center charges a ¥320 facility fee each visit. Classes are held when the dojo is open to the public. This means sharing the dojo space with other groups at times. On occasion, we hold Sunday evening Ki classes at a separate dojo. Currently, newcomers are welcome to start together on the first practice of each month (please check our calendar). Due to space limitations we made need to limit group size to 10-12 students per class. We strongly recommend you join our group on Meet Up and RSVP there. Please wear loose fitting clothing that you can move around in. Later, a dogi (practice uniform) can be purchased and is recommended. We can provide a map to a budo supply store.. There is a belt system and promotional tests are conducted periodically. With regular weekly attendance, most students can expect to progress one rank every six months or so. Most of our black belts took about three to four years to achieve that rank. 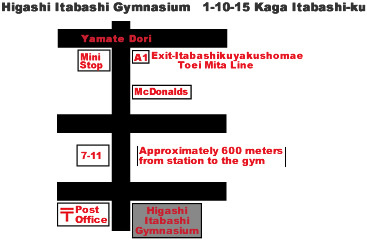 For more information, please contact Chris Koprowski by email at dojo@tokyoseidokan.com. Although aikido is a relatively recent innovation within the world of martial arts, it is heir to a rich cultural and philosophical background. Aikido was created in Japan by Morihei Ueshiba (1883-1970). Before creating aikido, Ueshiba trained extensively in several varieties of jujitsu, as well as sword and spear fighting. Ueshiba also immersed himself in religious studies and developed an ideology devoted to universal socio-political harmony. Incorporating these principles into his martial art, Ueshiba developed many aspects of aikido in concert with his philosophical and religious ideology. Aikido is not primarily a system of combat, but rather a means of self-cultivation and improvement. Aikido has no tournaments, competitions, contests, or "sparring." Instead, all aikido techniques are learned cooperatively at a pace commensurate with the abilities of each trainee. According to the founder, the goal of aikido is not the defeat of others, but the defeat of the negative characteristics which inhabit one's own mind and inhibit its functioning. Aikido literally means "the Way" (do) of "harmony" (ai) with "energy or nature" (ki). The objectives of Seidokan Aikido are to study the philosophy and the arts of aikido and further develop them to best suit the modern way of life. Seidokan Aikido is the study of aikido as a whole. Old traditions are analyzed and only the good traditions are kept and further developed so that they can be useful in our daily lives. Seidokan Aikido emphasizes the attitude of training. The students and the instructors grow together at Seidokan Aikido dojos. The students learn the fundamentals from the instructors and the instructors gain deeper understanding of aikido while sharing their knowledge with the students. Through earnest, realistic and sincere training, the students of Seidokan Aikido will learn the true meaning of aikido. The motto for Seidokan is "earnest, sincere, and realistic." This is derived from the kanji for "sei" (alternatively pronounced "makoto") which means "fundamental truth." Seidokan therefore emphasizes an approach to aikido which requires continued honest evaluation of both technique and philosophy. In particular, Seidokan follows the line of tradition of O'Sensei which encourages ongoing refinement of the art to accommodate a modern way of life. 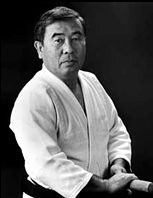 Technique as taught by Seidokan Kancho, Roderick T. Kobayashi, tends to utilize movements which are very small and economical. While Kobayashi Sensei encouraged his students to discover an aikido which is truly their own, he nevertheless stressed the importance of doing away with the extraneous and focusing on that which works. Effective technique which manifests the principles of oneness and "loving protection of all things" is the goal of Seidokan practice.